In some circles the pistol-mounted light has become quite popular as a personal-defense tool. The theory in the use of such lights is, of course, that you need to be able to identify the person as an actual threat before you employ deadly force. Further, we find that when we light up the target at night or in poor light, we can deliver our hits with much greater accuracy. However, there are some problems that can arise with the use of pistol-mounted lights that the defensive shooter should consider before making the transition. Armed citizens often have two problems when considering carrying the defensive handgun. The first is that a suitable pistol, in a substantial caliber, often seems heavy, especially when one has been wearing it all day long. The other is that this same pistol can be more difficult to conceal. Unfortunately, mounting a light on the defensive handgun makes it even heavier. And it makes it more difficult to properly conceal the handgun. Another potential problem that occurs when a person is using a pistol-mounted light is that he is tempted to use the pistol as a flashlight. I know of several cases in which the defensive shooter shined his light—and loaded pistol—on people and things that he had no intention of shooting. We’ve dealt with this issue before of a light on the front of your handgun, and the lack of police officer discipline causing negligent discharges because of the trigger-like actuation of the light (pressure switch near the trigger guard, along with the fact that officers stupidly go around with their finger on the trigger of their weapons while pointing them at people and things). Don’t do it this way, and keep your finger off the trigger. Simple discipline solves that problem. Lack of time, discipline and training also causes sympathetic muscle reflex responses like it did with poor Eurie Stamps (Jesus was that my rifle?). But in general I am a huge fan of pistol-mounted lights for the right reason and under the right circumstances. I think I’ve told the story about my purchase of one, but it bears repeating. Before my wife’s grandmother passed away, I had to work on her house, oftentimes late into the evening on the weekends, and oftentimes not getting started until after dark. The home was once in a great neighborhood, but it had turned for the worse because of gang activity, and it was in another town so we couldn’t be there except for me on the weekends. There were also reports of ne’er-do-wells hanging around, and visual evidence of home entry when we weren’t there (along with electronic evidence such as unexplained power bills). The home was left dark in order to minimize power bills, and every time I had to begin work after dark, I had to perform a sweep of the entire home. Sometimes I had my Doberman, Heidi, and I was always safer and happier to have her. But sometimes I didn’t have her with me. The first time I ever did entry and sweep of the home, I did so using the hand over wrist method for holding a weapon in one hand and light in another. The home had many rooms, many closets, multiple bathrooms and a garage as well as exterior structures. I swore I would never use that method again. It led to exhaustion and loss of fine motor skills associated with use of my hands and arms. Before the next time I got a weapon mounted light and haven’t looked back. I did entry, sweeping and room clearing using proper grip technique and without exhaustion. I’ll grant the point that the handgun is unable to be concealed, and it’s a bit too heavy to carry without a rigger’s belt. With a rigger’s belt and the proper holster it isn’t a problem, but you don’t usually carry a rigger’s belt, holster, firearm and weapon-mounted light to the grocery store (I wish we could all do that without people freaking out). So my gun with the weapon-mounted light sits under my bed. I’ll carry it in the car on trips, and sometimes I’ll carry it backpacking. Otherwise, I do the classic routine of carrying a gun and tactical light (separately) with my other weapons. You get something, you give up something. No solution is perfect, and one size fits all doesn’t work with firearms. Ronny Flanagan took pride in his record as a police officer in Plano, Texas. He had an incident-free career. He took safety training regularly. He was known at the range as a very good shot. Yet he killed a man when he was simply trying to press a flashlight switch mounted beneath the trigger on his pistol. In a deposition, Flanagan expressed his remorse and made a prediction. Flanagan was right. Three months after the October 2010 shooting in Plano, a 76-year-old man took a bullet in the stomach from a New York police officer trying to switch on the same flashlight model. At least three other people in the U.S. over the past nine years have been shot accidentally by police officers with gun-mounted flashlights, an investigation by The Denver Post found. Two victims were fellow officers. 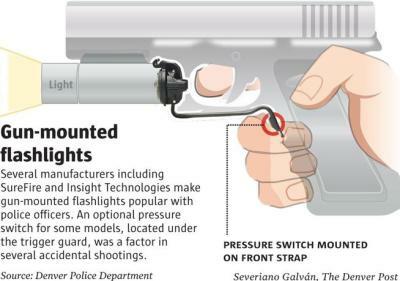 In Colorado, Denver’s police chief banned the use of tactical flashlights with switches below the trigger guard after two officers accidentally fired their guns last year. In Plano, Flanagan tried to shine his flashlight on a suspected drug dealer in a dark parking lot outside a fast-food restaurant. Instead, he shot and killed Michael Alcala, leaving a 2-year-old boy fatherless. “I don’t think it’s a very good idea to have any flashlight on a gun. You’re turning it into a loaded flashlight,” said Luke Metzler, a lawyer who sued Plano and the flashlight maker on behalf of the son, Michael Alcala Jr.
Here’s what’s happening. In order to depress the pressure switch, shooters (in this case, cops) are squeezing their third finger, and because they have no control over their sympathetic muscle reflexes, they are also squeezing their trigger finger at the same time. Suing the manufacturers of flashlights is about as nonsensical as I can imagine. That’s like suing a hammer manufacturer because I may choose to hit someone over the head with it. But what does this also show us? The astute reader says, “that cops are (a) using their weapon mounted light as a tactical light to see things in the dark, violating requirements for muzzle discipline, and (b) they have their finger on the trigger of their weapon, showing that they are violating requirements for trigger discipline. Recall what I said about this? My son was a SAW gunner in the 2/6 infantry, Golf Company, 3rd Platoon, during the 2007 combat tour of Fallujah and the pre-deployment workup. The senior Marines had experienced a tour of Iraq, and wanted their SAW gunners to have a round in the chamber, bolt open (the SAW is an open bolt weapon anyway), and finger on the trigger. They had seen combat and they wanted their SAW gunners with zero steps to shooting. Their lives depended on it. They also did CQB drills with live rounds, along with squad rushes. My son had an ID (if I’m not mistaken it was during training at Mohave Viper). He tripped and had a sympathetic muscle reflex, squeezing the trigger of his SAW. He spent an extended period of time in the “room of pain.” They wanted him trained to overcome that sympathetic muscle reflex (which can be done, but it takes hundreds or thousands of hours of drills). He spent the time learning to overcome that reflex, and performed well during his tour. He also tried to teach his “boot” Marines the same way he was trained, but the Marines had begun to change and focus more on cultural sensitivity training and other COIN tools. He got out of the Marine Corps. Why am I discussing this? Because no matter who you are, no matter how much time you spend, no matter how earnestly you wish it, no matter how many directives you write, if you are a SWAT team member, you will never be trained in such a manner. Never. You will never be trained like a U.S. Marine who has spent every day for a year and a half in pre-deployment workup to do a combat tour of Iraq. Because you will never be trained in this manner, your tactics are dangerous, all of the time, and in all situations. I don’t care how many times you have inexperienced Soldiers spend a week with you doing CQB drills. As for cops, if they obey the same rules as we do, this kind of thing won’t happen. And I don’t care how sad Ronny Flanagan is over this. The shooting is his fault. Period. If you keep your booger hook off of the bang switch, the gun won’t go boom. And for the sake of everything that is sensible, good and righteous, don’t use your weapon mounted tactical light as a flashlight so that you can see things in the dark.